The inception of a unique formula that introduced the world to “milk chocolate” dates back to the late 1800s. Spanning for over two hundred years of chocolate history, milk chocolate is one of the most indulgent product of the dairy and chocolate industry. Currently, European dietary lifestyles reflect an extensive presence of milk chocolate products, the popularity of which continues to spread across developed consumer marketplaces in the world. The original formula for milk chocolate represented a unique blend of milk, dairy ingredients, sugars, sweeteners and chocolate. Today, milk chocolate products have evolved to a considerable extent, and contain additional ingredients such as chocolate liquor, milk solids, cocoa butter, and lecithin. Changing tastes of consumers will drive the evolution of milk chocolate in the future, and new formulas will be tested by manufacturers to assess the scope of consumption. 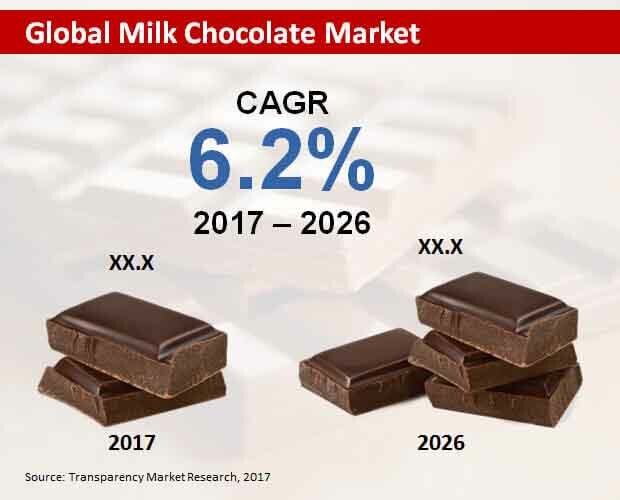 According to Transparency Market Research, the global milk chocolate market will be worth over US$ 95 billion by the end of 2026. A key trend influencing the manufacturing of milk chocolate is the growing demand for a variety of flavors to satisfy the taste buds of diverse consumer bases across the globe. In the coming years, milk chocolate producers will be adhering to the standardized formulas and won’t let new formulations impact their product safety and quality. The milk chocolate of tomorrow will contain near-equal amounts of chocolate liquor and milk solids, and less than 4% of milk fats to keep it trending among health-conscious consumers. Majority of milk chocolate will be produced and consumed in Europe, followed by North America and the Asia-Pacific excluding Japan (APEJ) region. The report estimates that during the period of assessment, 2017-2026, the milk chocolate market in Europe will reflect high value growth at a CAGR of 6.8%. Prominent milk chocolate producers in the world are based in European countries. Nestlé SA, Chocoladefabriken Lindt & Sprüngli AG, Unilever, Barry Callebaut, Ferrero SpA, and Chocolatiers (UK) Ltd. are key players in the global milk chocolate market, which are based in European countries such as the UK, Italy, Switzerland, and the Netherlands. In addition, companies namely, Mars, Inc., Mondel?z International, Meiji Co Ltd, Hershey Co, Blommer Chocolate Company, and Ezaki Glico are also observed as major milk chocolate producers in the world. The report estimates that certification is a key characteristic that distinguishes organic milk chocolate from conventional milk chocolate. Organic milk chocolate derived from organic farming and diary practices will remain expensive in the future. Conventional milk chocolate, on the other hand, will be more affordable and offered across a wider variety of flavors. Consumers may be attracted towards organic milk chocolate for the minimal processing involved, whereas milk chocolate made from conventional techniques will witness a sharp increase in demand due to the presence of preservatives and for offering better taste. Over the forecast period, the consumption of conventional products is expected to remain considerable higher than organic products in the global milk chocolate market. Among the vast variety of chocolates and flavored cocoa products consumed in the world, milk chocolate has carved its significant space in the global consumer marketplace. From food & beverages to pharmaceuticals, and even cosmetics, milk chocolate has spanned its applications across diverse industrial verticals. New formulations for milk chocolate are being tested to extend their scope in terms of flavor, taste and nutrition. The global market for milk chocolate is likely to incur sharp value growth in the coming years, particularly when milk chocolate products are penetrating dietary lifestyles of consumers across the globe. Transparency Market Research’s exclusive forecast study on the global milk chocolate market is a comprehensive report that traces the evolution of demand for milk chocolate and maps its growth in the near future. The research offers valuable information on how the global milk chocolate market will expand during the assessment period, 2017-2026. Information provided in the report reflects the latest market trends and addresses to the objective concerns of milk chocolate producers. A constant dialogue with companies producing milk chocolates has furnished the analysis on notable opinions and trade insights. The impact of innovative production techniques, new manufacturing standards & regulations, changing consumption patterns, and emerging applications is effectively reflected across all the research offerings of this study. Total market sizes, market shares, segmental shares, and company shares are some of the key parameters used to interpret and quantify data procured from secondary and primary research sources. Multidisciplinary research methodologies have been employed, and information procured from authentic databases and market participants has been streamlined and aggregated. This information has been purposed to generate a baseline of market size, segmental values and regional market size estimations. First-hand information on the most lucrative regions for selling milk chocolate products to the most nascent consumer marketplaces for milk chocolate is being offered. This information holds great value for a milk chocolate producer aiming to expand its global footprint. The report is also offering volumes of data in the form of values and figures across multiple segments and sub-segments as illustrated in the market taxonomy below. A key advantage of assessing the research offered in this report is understanding the competition. Considering how milk chocolate companies are seeking assistance in tracking their competitors and decoding their growth strategies, this report serves as a valuable business document for each company producing milk chocolate in the world. From industry leaders to niche players, information on competition assessment detailed in this report discloses latest strategies and current market standings of prominent milk chocolate companies. The scope of this report is to enable players in the global milk chocolate market take informed steps towards future market direction. This report will assist companies in expanding their presence in the global milk chocolate landscape in the coming years.